If you’ve ever tasted a thick prime steak dry-aged 4 to 6 weeks (and reverse seared), you’ve come pretty close to heaven on earth. One of the best dry-aged beef purveyors we know is Chicago Steak Company. We asked Chicago Steak CEO Matt Crowley to share his thoughts on the difference between dry- and wet-aged beef and how to dry-age beef at home. If you’ve bought a steak from a grocery store, there’s a good chance you’ve purchased a wet-aged steak. Unlike dry-aging, which is centuries old, wet-aging is a relatively new technique, invented in the 1950s. Wet-aging involves vacuum sealing steaks—the same method used to prevent freezer burn when freezing meat. Though some people prefer wet-aged steaks, most Americans prefer dry-aged beef. Without oxygen, the chemical changes that need to occur for dry-aged taste just aren’t possible. While a small amount of enzymatic changes can happen in wet-aged beef, the overall change is minimal. This leaves wet-aged steaks with a more metallic, “bloody” taste, while dry-aged steaks have richer, fuller-bodied, and more complex umami flavors. Wet-aging is popular with many grocery stores because it is a far less expensive process than dry-aging. While dry-aging typically takes 4-6 weeks, requires specialized aging lockers, and causes product loss due to trimming and evaporation, wet-aging takes less time, less equipment, and causes no loss of product. As a result, wet-aged beef is easier to find and cheaper to buy. While it’s possible to dry-age beef at home, it is far more difficult and involved than some guides (including several online) would lead you to believe. One popular misconception is that you can dry-age steaks by lining them with cheesecloth or paper towel, then leaving them in your fridge for four to seven days. While this method dehydrates steaks (which can heighten flavor intensity), it does not properly age them. Beef needs to be aged for at least 14 days for enzymes to properly tenderize fibers, and needs to be aged for at least 21 days for complex flavors to develop. One week in a fridge—cheesecloth or no cheesecloth—won’t make that happen. Instead, dry-aging takes dedicated equipment, time, and large, primal cuts. If you want to dry-age beef at home, you’ll need to start out with a large cut of top-grade, USDA Prime beef. Dry-aging needs to be done before a roast is cut into individual steaks, so go with something like a large rib roast, three ribs minimum. Also, be sure to buy a cut that still has a thick cap of fat on its exterior. This way, that side will only lose fat when you trim the exterior at the end of the aging process. You’ll then need the following equipment: a dedicated refrigerator, a small fan, a tray, and a wire cooking rack. Note: Do not age beef in a fridge with other foods, as your beef will pick up flavors from those foods and vice versa. Dry-aging in a multi-use fridge will also throw off moisture levels. The need for a dedicated fridge is the biggest challenge and added cost to at-home dry-aging. First, select your fridge and set up a small, electric fan inside to maintain airflow. Next, put a wire rack on top of a tray. The tray is to collect any drippings. Make sure the bottom of the rack is elevated so that airflow is possible on all sides of the beef. Set your cut of beef on top of the wire rack. Then, slide the tray, rack, and beef into the fridge and wait. Wait 2-4 weeks if you’re only looking for added tenderness, 4-6 weeks for that famous dry-aged taste, and 6-8 (or more) weeks if you’re looking to develop some seriously funky aromas and flavors. While it is okay to check on your beef occasionally, remember that every time you open your fridge’s door you throw off moisture levels and invite unwanted odors in. After you have aged your cut for your preferred length of time, remove it from the fridge. At this point, the exterior will be dry, deep-red or purple/brown, and may have developed mold. Trim away any of this meat, as well as any exterior fat. Finally, cut the beef into individual steaks, according to your tastes. We recommend between 1¼ to 2 inches thickness, though some grillers prefer steaks as thick as 3 inches or more. Remember: when aging at home, it can be hard to adjust and control things like humidity, airflow, and temperature without professional equipment. Because of this, dry-aging at home is generally less precise than professional dry-aging. This means that it can be tough—if not impossible—to replicate the signature taste of a specific restaurant or butcher’s dry-aging process. 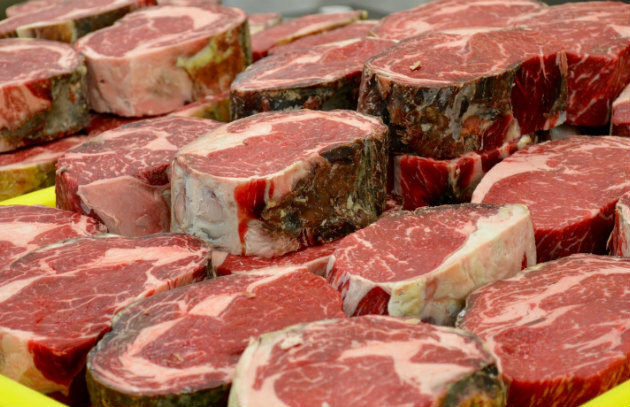 Learn more: What Is Dry-Aged Beef?